This post was created in collaboration with One Degree Organics, a brand I’ve been proudly working with for over a year. 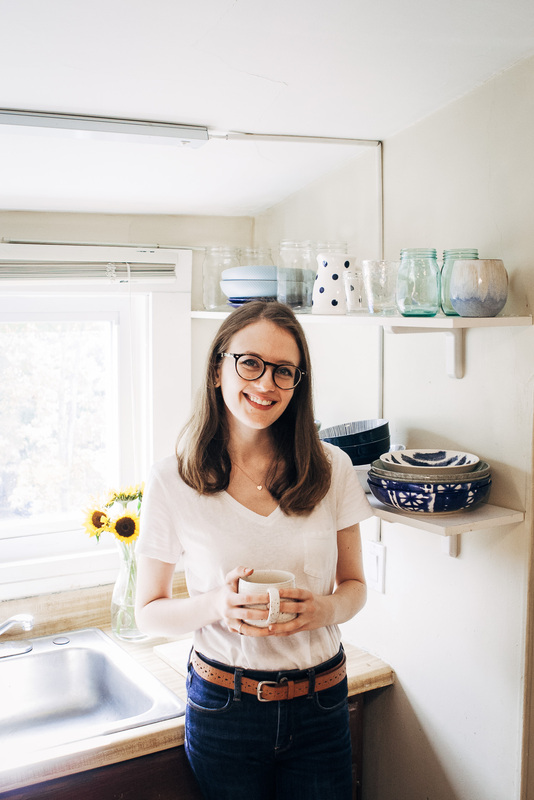 I personally stand by their products and have used many of them in my own kitchen for years, including their sprouted flour, tortillas, granola, and now bread. One Degree Organics is a family-run company that is full of kind, creative, and welcoming people. I am so proud to be continuing my work with them! This Vegan Autumn Panzanella is the coziest bread salad you’ll ever have! With roasted brussels sprouts, homemade croutons, and maple tahini vinaigrette. You guys, I am so excited to bring this recipe today because it features One Degree Organics’ new Lentil Grain bread – it’s SO GOOD. It’s 80 calories a slice, with fiber, protein, and a handful of vitamins and minerals. But more important to me is the taste – it’s a little sweet, nutty, hearty, and completely delicious. I’ve been having this for toast for the last week straight, hot out of the oven and spread with a little vegan margarine. This Lentil Grain bread is next-level when it’s tossed with olive oil, salt, and pepper and pan-fried until golden and crispy. It’s such a simple cooking method that pays off in BIG flavor. Plus, who doesn’t love croutons?! I love carb-y elements in a cool weather salad because it adds that cozy factor that most salads lack. 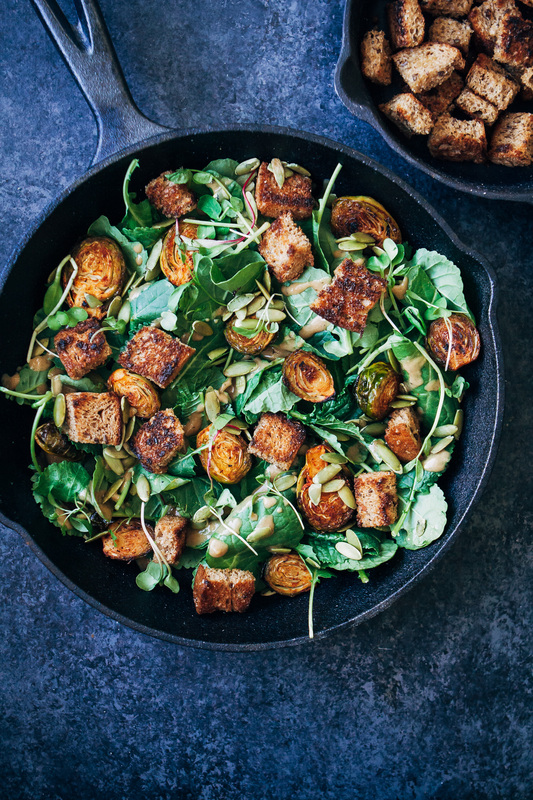 This salad also has crispy roasted brussels sprouts, and everything is drizzled with a killer maple tahini dressing. I know y’all are going to love it! 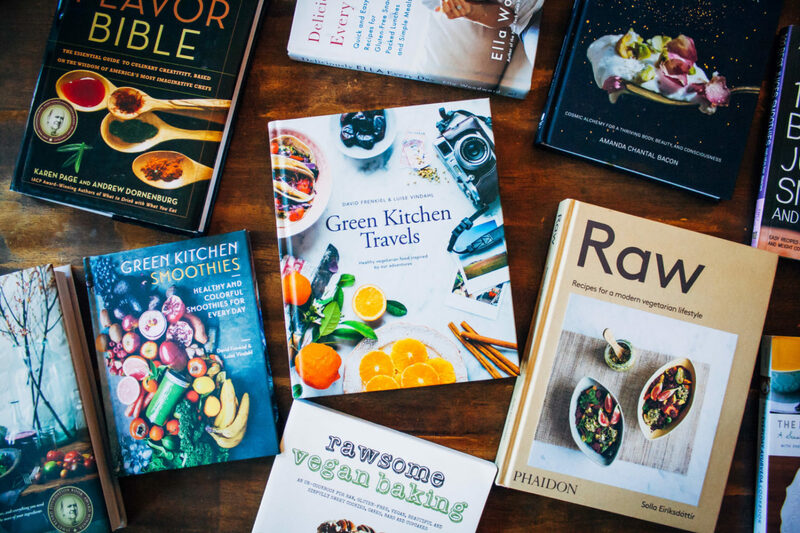 Speaking about ethical products, what I love about One Degree Organic’s line is not only that their line is 100% plant-based and vegan, but that they also use vegan and sustainable farming practices in making their products. I love supporting companies like this because every dollar spent is a vote towards a world that respects animals and the environment. Cheers to that!! P.S. This bread would also be delicious in my avocado toast recipe or in this vegan breakfast salad! This vegan autumn panzanella is the coziest bread salad you'll ever have! With roasted brussels sprouts, homemade croutons, and maple tahini vinaigrette. Wash, trim, and cut your brussels sprouts in half. In a bowl, mix the brussels sprouts with the seasonings until evenly coated. 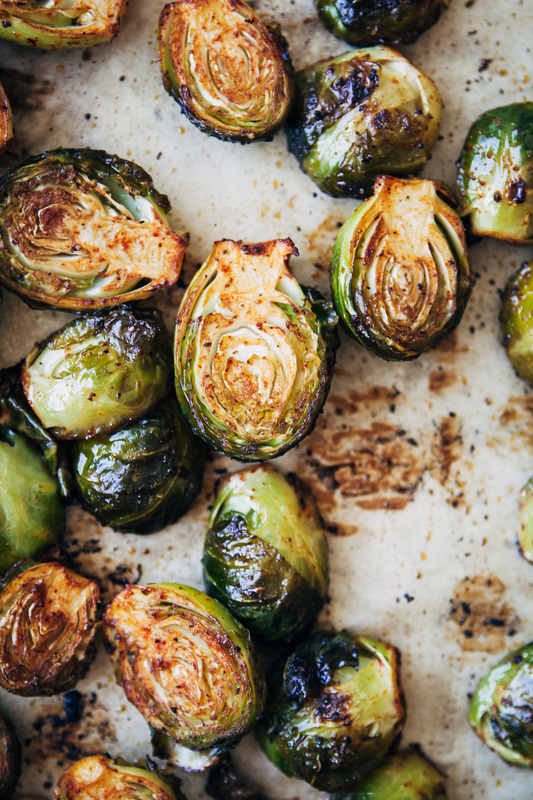 On a baking sheet lined with parchment paper, bake brussels sprouts in the oven for 25-30 minutes, stirring halfway. While brussels are cooking, take 3 slices of One Degree Organic's whole grain bread and cut each slice into 16ths, or 1/2 - 1 inch sized cubes. In a bowl, toss bread cubes with a drizzle of olive oil, and salt and pepper to taste. Bring a frying pan to medium heat. Add in the croutons and toast, stirring frequently, until the desired brownness is reached. Add all ingredients into a bowl and whisk vigorously to combine. Layer your bowls with a bed of baby kale or mixed greens. 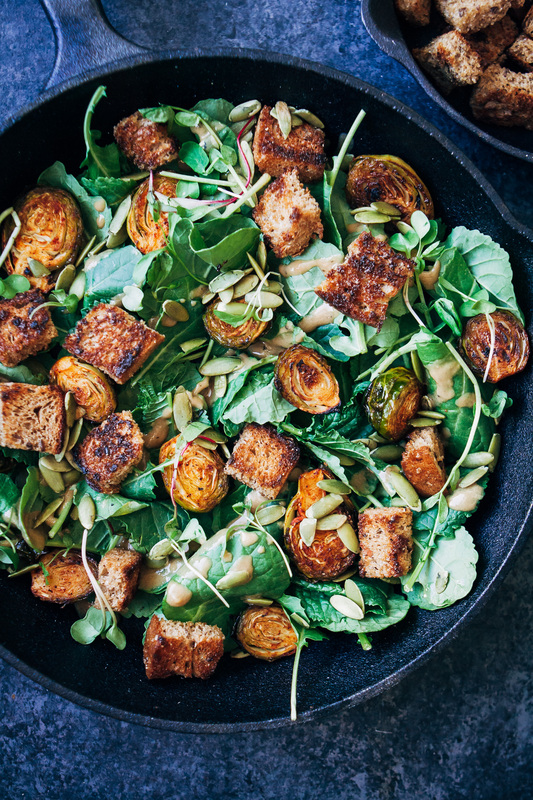 Add on the brussels sprouts and homemade croutons, then drizzle everything with the maple tahini dressing. Top it off with pumpkin seeds or microgreens, if you'd like. This is seriously one cozy salad for Fall Sarah! 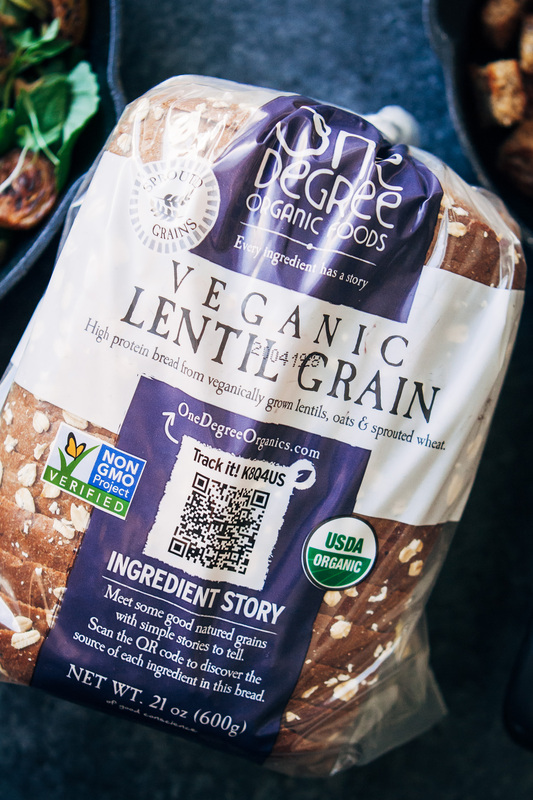 And I need to get myself some of this lentil grain bread, it sounds too good to be true! Really clever and it looks great! Well done!